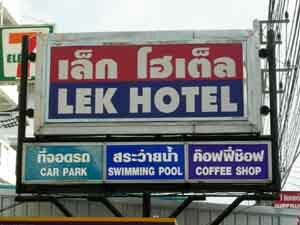 Lek Hotel Pattaya Thailand seems to be a hotel that people either like or don't like. This hotel has a strict control of overnight guests who have to leave their ID at the reception. If the overnight guest wants to leave in the morning the ID will only be released after a call to the hotel guest's room. Some say the buffet is made in heaven and others warn you of the dreadful food. The staff at this hotel gets thumbs up or thumbs down depending on who you are talking to. "Where is it And What Are The Rates?" It's only maybe 250 meters to Pattaya Beach and Pattaya Beach Road. This is not a beach where you want to take your kids or where you can enjoy a beautiful sunset without jet skis or vendors trying to sell you something. Some people call it a budget hotel yet there are hundreds of hotels that have the same rates or better. No doubt the location is excellent for someone who wants to live in the "heart of Pattaya". I would not recommend this place for families, older folks or anyone who prefer to be in a less crowded area with less traffic. How does Lek Hotel with other Pattaya Hotels? Do some comparison shopping by using the search box below. It will give you a good idea of what's available in Pattaya. Enter your chosen dates and hit the search button. Go to Agoda.com to find ALL hotels available in Pattaya. You will be able to look at pictures, description, Google map, room rates, amenities and reviews.